Hypertension is a major risk factor for cardiovascular events, including ischaemic stroke and haemorrhagic stroke. 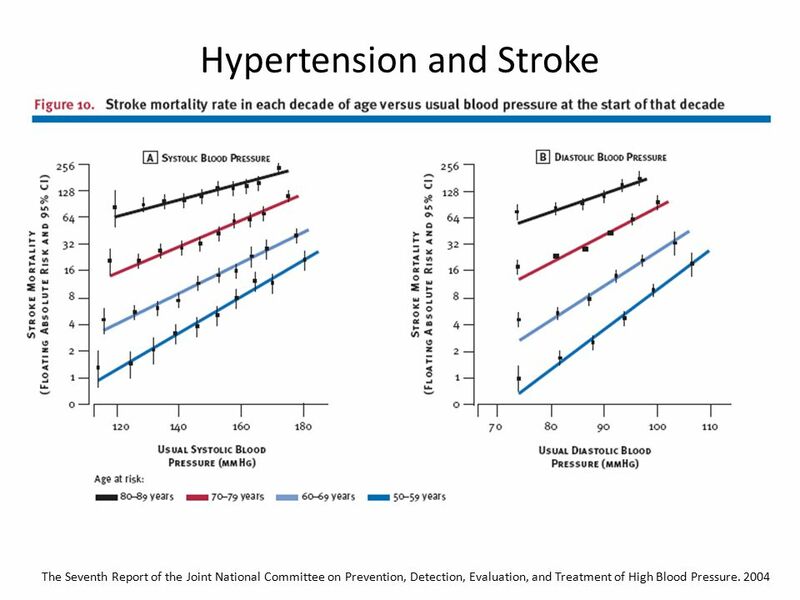 Hypertension is the single most important modifiable risk factor for stroke. It is a contributing factor in over 70% of strokes. It promotes the formation of atheroma in large and medium sized vessels e.g. carotids and aortic arch. It also damages small end arteries. It may cause LV dysfunction and atrial fibrillation. The benefits of treatment are most significant in those younger than 60. Blood pressure is measured as the level of pressure when the heart is contracting (Systolic blood pressure) and when the heart is relaxed and filling with blood (Diastolic blood pressure). These pressure levels change continually as part of everyday life. The British Hypertension Society Guidelines recommend that the diagnosis and treatment of hypertension should be based on an average of at least two readings after 5 minutes at rest in the seated position. There is no absolute level that defines BP. NICE recommends that lowering raised blood pressure decreases the risk of stroke, coronary events, heart failure, and renal impairment. Hypertension is a significant and treatable risk factor for both Ischaemic and Haemorrhagic stroke. It is estimated that 25% or more of strokes may be due to hypertension and this increases to 60-70% when discussing haemorrhagic stroke. 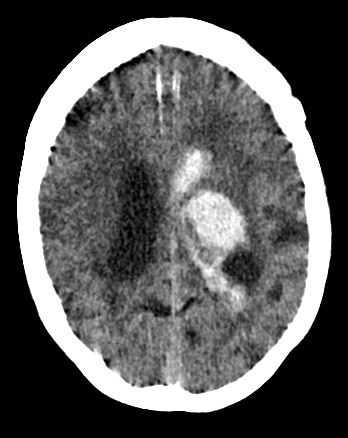 It is by far the main risk factor for most causes of Spontaneous Intracerebral Haemorrhage. Those at most risk are those who are non-compliant with therapy, those with hypertension at a young age < 55. Smoking also adds to risk. It is important to remember that hypertension is a chronic illness and prior to presentation has almost always been present for years, perhaps undiagnosed due to a lack of screening opportunities. In those in whom it has been diagnosed treatment may have been suboptimal and many patients, especially the young have difficulty taking antihypertensive therapies for a variety of reasons. Chronic exposure of small arterioles to hypertension leads to lipohyalinolysis to the small penetrating arteries (i.e. 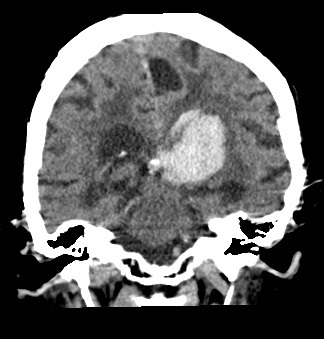 Lenticulostriate from the middle cerebral artery, paramedian pontine perforators from the Basilar artery) in the brain predominantly supplying white matter. These vessels often come off abruptly from much larger vessels at right angles and it suggested that these vessels are exposed to higher than expected pressures than would be seen if there was a normal gradated step down in vessel calibre and so are more prone to ongoing damage. There is much overlap with the topic of Small vessel disease. Vascular changes include obstruction to vessels which causes the typical lacunar stroke clinical syndrome with corresponding imaging or microaneurysms also called Charcot-Bouchard aneurysms may be apparent and they can rupture causing bleeding. 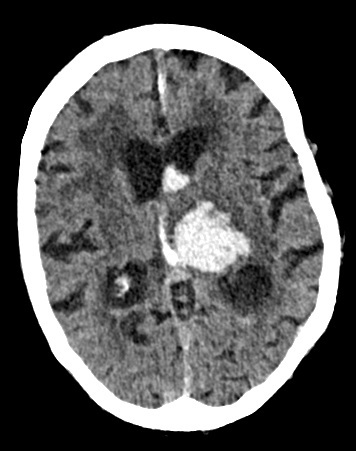 The same areas of the brain affected by hypertensive lacunar strokes are also blighted by hypertensive bleeds. The typical areas are the basal ganglia, thalamus, cerebellum and the ventral pons. With time those with hypertensive changes have significant periventricular changes with hypodensity or bleeds. Hypertension also plays a role in general atherosclerosis and is a cause of heart disease and left ventricular hypertrophy which can precipitate atrial fibrillation. Blood pressure is a dynamic physiological measurement that can fluctuate by minute, hour and day and that this variability in itself is a risk factor for stroke distinct from the simple absolute measurement of DBP or SBP. Short and long term BP variability is associated with cardiac, vascular and renal disease. The suggestion is that treatment should focus on both lowering BP but also reducing its variability. Notably β blockers have the poorest effect on blood-pressure variation. Cerebral autoregulation which closely controls cerebral blood flow across a wide variety of systemic blood pressure is altered in the acute stroke setting. Generally despite there being a number of large clinical trials and systematic reviews, there is no clear guide for BP following acute ischaemic stroke. There is evidence that BP should be lowered rapidly in patients with ICH. THis is very much based on the Interact trial. This did not show a significant reduction in death or severe disability but an ordinal analysis of modified Rankin scores showed improved functional outcomes with intensive lowering of blood pressure to a target of SBP < 140 mmHg. There is evidence that Lowering BP reduces the risk of stroke and the more the BP is lowered, the more effective it is. The PROGRESS trial showed that treatment to lower blood pressure in people who have had a stroke or TIA reduces the risk of further stroke. PROGRESS study Randomised trial of a perindopril-based blood-pressure-lowering regimen among 6105 individuals with previous stroke or transient ischaemic attack This blood-pressure-lowering regimen reduced the risk of stroke among both hypertensive and non-hypertensive individuals with a history of stroke or transient ischaemic attack. Combination therapy with perindopril and indapamide produced larger blood pressure reductions and larger risk reductions than did single drug therapy with perindopril alone. Lancet. 2001 Sep 29;358(9287):1033-41. NICE have very straightforward guidance. Those with a blood pressure > 140/90 mmHg or higher with TIA or stroke should be treated. There is no one size fits all acute regimens so stroke physicians have some latitude for treatment in the acute scenario for ischaemic stroke. Outside the acute thrombolysis or hypertensive emergencies pathway I aim for a SBP of < 220mmg or ideally < 200 mmHg. Personally if patient can take oral agents I start with those and may consider Amlodipine 5 mg PO or Ramipril 2.5 mg acutely. Note there is not always a need to give medication. The patient may be in pain, be in urinary retention (easy to miss) or distressed and calm reassurance may do wonders. Set some treatment goals such as to lower BP by 10-20% acutely over several hours. In extreme cases or when oral cannot be given or for thrombolysis patients IV Labetalol 10-20 mg bolus may be useful. For haemorrhage there is evidence to lower to SBP of 140 mmHg and again IV Labetalol may be useful. Several lw dose agents may be needed. Steps 3 and 4: Treat as for patients under 55 years. Cardiovascular risk reduction. Aspirin reduces the risk of cardiovascular events and myocardial infarction. Unduly high blood pressure must be controlled before aspirin is given. Unless contra-indicated, aspirin is recommended for all patients with established cardiovascular disease. Use of aspirin in primary prevention, in those with or without diabetes, is of unproven benefit. For the role of aspirin in the prevention of stroke in patients with atrial fibrillation, see Arrhythmias. Statins are also of benefit in cardiovascular disease or in those who are at high risk of developing cardiovascular disease.